Flatworms live in water or environments with high moisture. Some species are microscopic, while others may be as long as 164 feet. All get their names from their characteristically flat bodies. The three main types of flatworms are free-living, flukes and tapeworms. Both flukes and tapeworms are parasitic, relying on other host animals for survival. Although flatworms do not have highly evolved biological systems, they have several adaptations that optimize their survival. The shape of a flatworm allows the species to survive without a circulation system. The purpose of circulation is to deliver oxygen and remove waste from cells throughout the body -- specifically the cells furthest from the surface. Given the creature's flat body, even the innermost cells are close enough to the surface to receive oxygen and eliminate waste. Flatworms are hermaphrodites and have both male and female sexual reproductive organs. They reproduce sexually with other flatworms. After mating, both flatworms can lay fertilized eggs. If no other flatworms are present, they can also reproduce asexually by fertilizing their own eggs. Fertilization happens internally. Then the flatworms release the fertilized eggs, or zygotes, into the water, where they hatch. Using the basic process of cell division, flatworms are able to regenerate missing pieces of their bodies. Without regeneration abilities, losing part of their bodies could be fatal. This adaptation also provides another form of asexual reproduction. If a worm is cut in half, the head of the worm will regenerate a tail and the severed tail will also regenerate a new head, resulting in two flatworms. Many flatworms, especially free-living species, have developed basic nervous systems. This allows the worm to find and recognize food. Flatworms have a head at one end with two eye spots. While flatworms cannot see like we can, they do recognize and respond to changes in light. They have two nerve cords running down each side of the body and triggering muscles to react to stimuli. 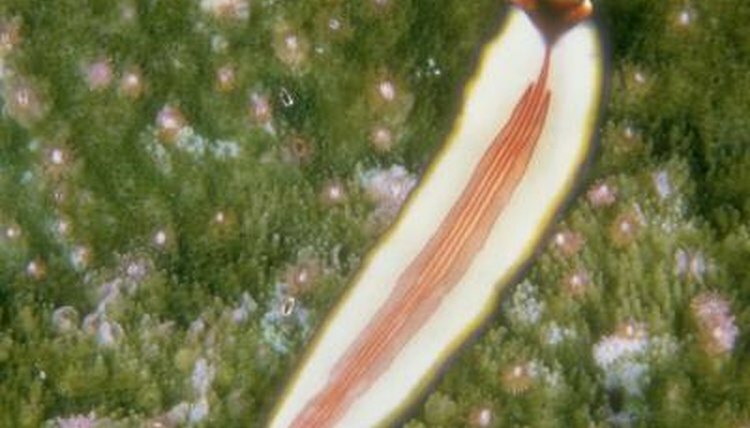 In addition, flatworms have sensory cells on either side of the head. These cells are sensitive to chemicals, food and movement around the flatworm. Parasitic flatworms have hooks on their mouths that allow them to securely attach to their hosts. Since the worms are eating the food the host has digested, these flatworms do not have the digestive and nervous system development necessary for them to be free-living . This allows the flatworms to put their energy into reproduction. Parasitic flatworms protect themselves from the hosts' digestive liquids by developing teguments or coverings around their bodies.